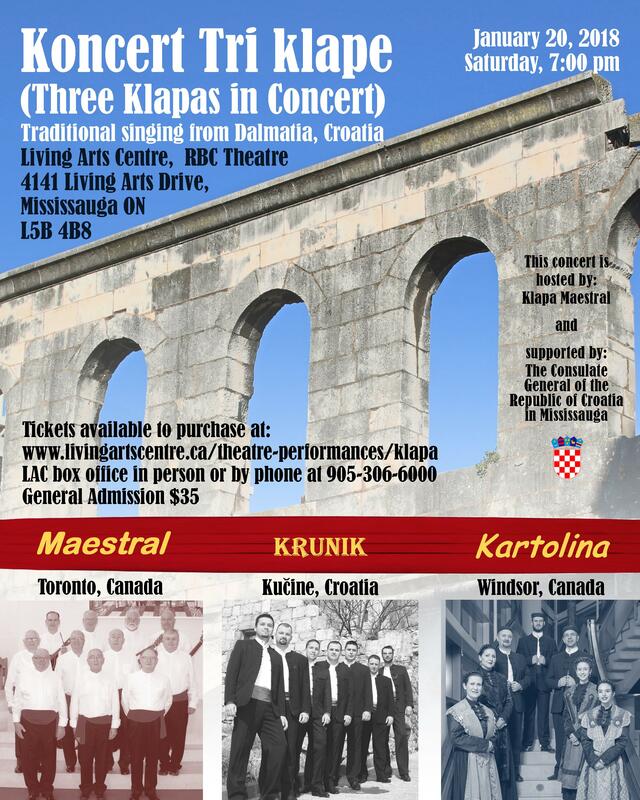 Please join us for an evening of traditional (“Klapa”) singing from Dalmatia, Croatia, with performances by three vocal ensembles; the host “Klapa Maestral” from Toronto – Canada, “Klapa Kartolina” from Windsor – Canada and “Klapa Krunik” from Kučine – Croatia. Almost every Dalmatian town has its own klapa and sometimes many more then one. For the first time, the audience in the Greater Toronto area will have an opportunity to listen to the performances of three of them. Pridružite nam se na večeri Dalmatinske klapske pjesme, gdje će nastupiti tri klape; domaćin koncerta klapa Maestral iz Toronta u Kanadi, klapa Kartolina iz Windsora u Kanadi i klapa Krunik iz Kučina u Hrvatskoj. Gotovo svi dalmatinski gradovi i mjesta imaju svoju klapu, a mnogi imaju i više njih. Po prvi put publika u Torontu i okolici će imati priliku poslušati izvedbe triju klapa. The concert will be held on January 20th, 2018 at 7:00 pm, at the Living Arts Centre / RBC Theatre in Mississauga, Ontario, Canada, 4141 Living Arts Drive, L5B 4B8. Klapa Maestral from Toronto is a Canadian-Croatian, all male vocal ensemble founded in 2013 with the purpose of preserving Croatian cultural identity and its unique and internationally recognizable musical heritage – klapa singing. Since its inception, Klapa Maestral has strived to promote traditional a’cappella and modern songs from beautiful Dalmatia and share them with Croatian and Canadian public through concerts and public appearances at festivals and multicultural events. Over the years Klapa Maestral has given concerts in Kitchener, Waterloo, Welland, Mississauga and Toronto, Croatian parishes, organized concert/dinner events for the Croatian community and retirement homes in the Greater Toronto Area and participated in many Croatian cultural groups’ celebrations. The Three Klapas in Concert event is a pinnacle of Klapa Maestral’s achievements to date. Klapa Krunik is all male, a’cappella vocal ensemble (Dalmatian klapa) from Kučine, Croatia. They were founded in 2011 and the ensemble was named after the natural water spring Krunik in Kučine, near the city of Split. 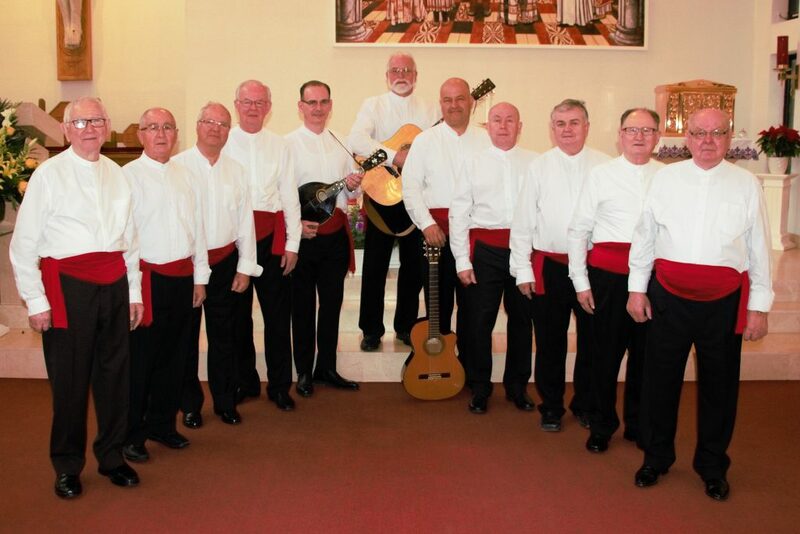 All the members share their common love for the traditional klapa, acapella singing. The ensemble is not consisted just of members and singers, they are friends too, which is in the true spirit of the klapa meaning. They are particularly proud of their own klapa festival which they host every year in Kučine, organized since 2011. Klapa Krunik belongs to the very top of the klapa music scene in Croatia and they have been the finalists of the Dalmatian Klapa Festival in Omiš multiple times and the Festival`s prizewinners as well. At their debut performance at the Festival in Omiš, they won the best performance award and at the Grand Finale evening of the male klapas, they won 3rd place. Klapa Krunik also performed at the main event of the 50th jubilee festival of Dalmatian klapa in Omiš, in 2016. 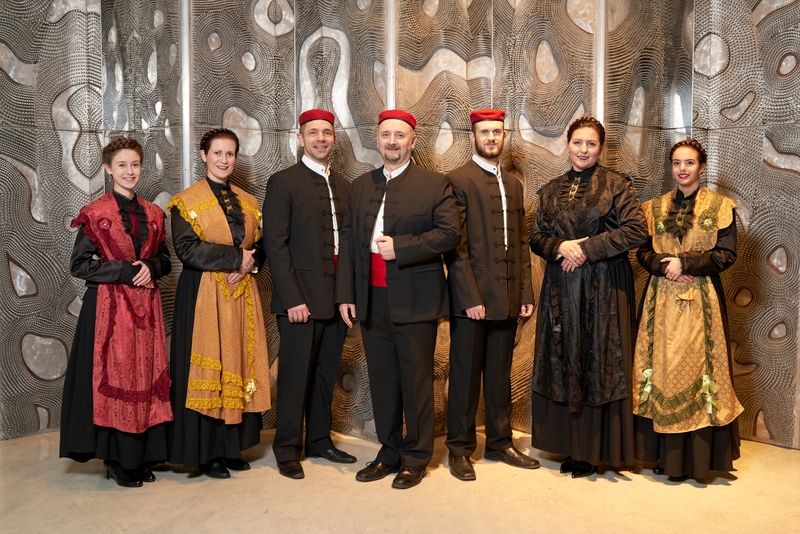 Klapa Kartolina is a mixed voices, a’cappella vocal ensemble (Dalmatian klapa) based in Windsor, Ontario, Canada and is affiliated with St. Francis of Assisi Croatian Catholic Parish. Klapa Kartolina was founded in 2013 by a handful of music enthusiasts led by Višnja Tijardović and has performed on many cultural events and concerts in Canada and Croatia. The group has performed on several, prominent concerts of klapa music in Croatia, such as the festivals in Zagreb and Kostanje and most notably the 50th Dalmatian Klapa Festival in Omiš in 2016, as a guest performer. 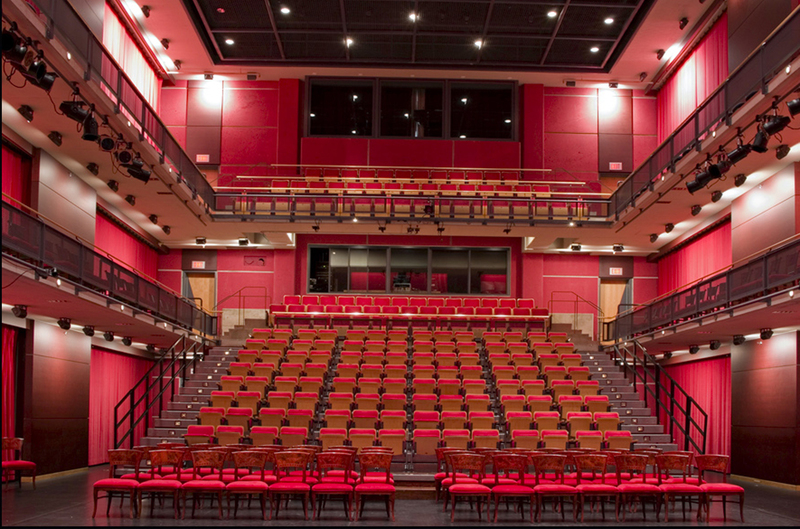 Klapa Kartolina has organized their very first Klapa concert in Windsor in 2015, at the Art Gallery of Windsor, which became an annual concert event.